Read what participants have to say about their experiences at Alderleaf courses. Further down the page you can watch video testimonials from graduates of the Alderleaf Wilderness Certification Program. 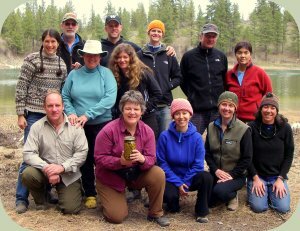 "I can honestly say that my time in the Alderleaf Wilderness Certification Program was incredibly instrumental in changing my own paradigms about myself and the world around me. My time here has been fun, immensely informative, and dramatically rewarding." "I would recommend the Alderleaf Wilderness Certification Program to anyone wanting to reconnect with nature and a desire to live simply, with and for the land. Through this program I have become the change I was waiting for!" "The wilderness survival course truly opened my eyes to how wonderful and plentiful the outdoors is. Knowledge is empowering. It was truly a life changing event!" "I really enjoyed all the hands-on training. It was an amazing experience. The course really made me aware of my environment and my abilities as a human." "Very comprehensive and very knowledgeable instructors! The majestic beauty of the site really enables you to be “in the wild” yet next to the amenities of a camp." "Great course, good pace, and good mix of teaching, hands-on activities, and demonstrations on how to make tinctures, decoctions, infusions, and salves." "I’m very pleased with the wildlife tracking course at Alderleaf Wilderness College. It created an interest that I can share with my family!" "Since the class I have been spotting wildlife sign left and right when I go into the woods. We learned how carnivores use the landscape and how that knowledge can easily facilitate finding both tracks and sign in predictable locations." "Alderleaf has not only been a school of wilderness knowledge, it’s also taught me patience, perseverance, and deep appreciation for all that supports our lives. I now feel at home in the woods!" Check out testimonials from employers who have hired our graduates. Learn about what alumni have done after graduating from Alderleaf.